Research Week is The University of Texas at Austin’s annual celebration of undergraduate research and creative activity. Research Week provides opportunities for undergraduates to explore UT’s vast and diverse community of research and creative work, and to find ways of getting involved. Read more about Research Week. Research Week 2019 is scheduled for April 15-19, 2019. Research Week provides excellent ways for students to learn about research opportunities and present their own research, and for departments, colleges, and programs to showcase their students’ achievements. 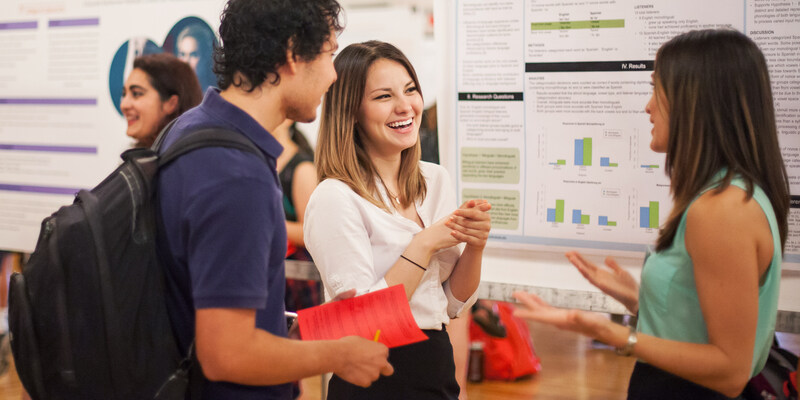 Events range from undergraduate poster presentations, exhibitions, performances, and symposia to guest speakers and workshops aimed at helping undergraduates achieve their research goals. Don’t miss the multi-disciplinary Longhorn Research Poster Session, which will take place on Wednesday, April 17, 12-2 p.m. in the Union Ballroom. Read more about How to Get Involved, whether you are a student, faculty member, or staff. Departments, colleges, programs, and organizations may register Research Week events between January and March. Submissions will open in January 2019. Please ask your college, school, department, or program about submission or registration deadlines for Research Week events other than the Bazaar. Research Week is co-sponsored by the Office of Undergraduate Research and the Senate of College Councils.